Nick Bosa is a star defensive tackle from Ohio State who is projected to be one of the top picks in the 2019 NFL Draft. Over his two year and three game Ohio State career Nick had 47 tackles and 17.5 sacks. Injury cut his 2018 short, after which he quit the football team to focus on the 2019 draft. Dwayne Haskins is a star quarterback from Ohio State who is projected to be one of the top picks in the 2019 NFL Draft. Dwayne was a one-year starter for Ohio State, but in that year broke many passing records. In 2018 he threw for 4,831 yards and 50 touchdowns. His 50 TDs broke Drew Brees’ Big Ten single-season passing touchdown record. 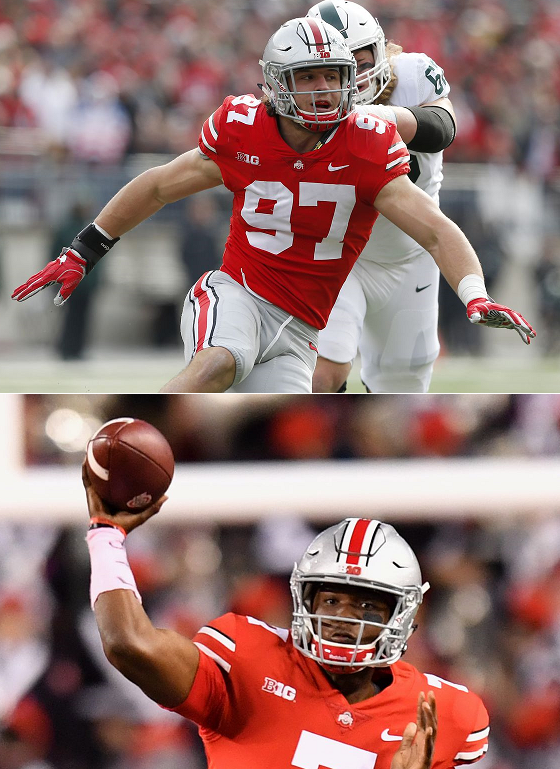 Most pundits have Nick Bosa as the number one pick in the 2019 draft. Is it possible his teammate Dwayne Haskins is taken before him? Unlikely, but time will tell.